Invite friends and family to a special celebration with our I Do Invitations! Each invitations features a modern wedding dress, tux, and the message "A Bridal Shower". Inside there is room for all the details! Includes 8 invitations and envelopes per package. 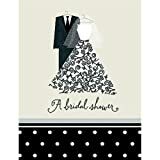 Tagged 8ct, Bridal, Invitations, Shower. Bookmark the permalink.